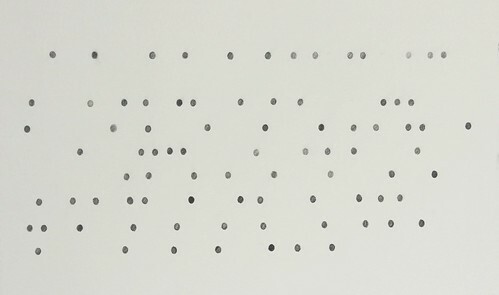 What you should know and be able to do (text voids) by Sarah Rushford, graphite on paper, 24″ x 16″. Have you ever felt like you’re floating through whatever you’re doing at the moment? Perhaps it’s a craft, a skill, or a career. What’s important to note is that the floating isn’t a surrender or a sign of boredom; it’s a movement from control to subconsciousness, from instruction to intuition. Interdisciplinary artist Sarah Rushfordexperiences this exact sensation as she works on projects, allowing her to transcend the boundaries of craft and theory and focus solely on the simplicity of the process.What you should know and be able to do is Rushford‘s solo exhibition of text art, works on paper, audio, video and sculpture that come from a space between the living argument of consciousness and the vivid interior self. Of her process, Rushfordsays, “I have a deep trust in intuition. I know there is a thinking that is above my conscious thinking that comes through doing. To get at these higher connections that are made, miraculously, I have to be very busy with the ‘lower-level’ work, much of which is cast off when the final work is realized.” This creates final products of simplicity: materials like flour, sewing needles, ice and children’s games and techniques like rubbing, folding, fixing and pressing. The almost over-simplistic nature of her projects leaves us with a strikingly vulnerable beauty. “My process is impatient, imprecise, inarticulate, playful, and I often feel foolish,” Rushford says. “When a project comes to fruition, I have a mastery of a strange skill. I am working to articulate this mastery that exists on a continuum with foolishness.” The level of honesty and universality radiating from Rushford and her works is appealing to anyone of any background, any discipline. As a multimedia artist, Sarah Rushford is currently working in writing, video and collage. In 2010, she started Circadia, a web and print design company for artists, small businesses and non-profits. She is also a member of Rise Industries, a forum for exchange between artists and a starting point for interdisciplinary collaborative projects. What you should know and be able to doopens tomorrow, Friday, October 25th at Hallway Gallery with an opening reception from 6-9pm. The exhibition will run through Saturday, November 30thand will feature an Artist Talk/Screening on Saturday, November 2nd from 7-9pm.